Rafael Lozano-Hemmer, a multimedia artist whose work now spans the second floor of the Hirshhorn Museum in D.C., wants to resist nationalism. He says that’s the purpose of his three-part, interactive installation, “Pulse.” The exhibit replicates the participant’s heart rate in different ways, converting it to waves in a shallow pool and flickering lights, among other things. Lozano-Hemmer says it’s not just about hearing many hearts beat as one. It’s about repurposing technology, fingerprinting, for instance, for purposes of connection rather than control. “At a time when we are seeing ethnic nationalisms on the rise, dividing people along simplistic categorizations, it is critical to misuse these mechanisms of control to create connective, anonymous landscapes of belonging,” he says. The message of “Pulse” is powerful, even if its connection to nationalism is more an intention than a result. On the other hand, “Pulse” is overwhelmingly pro-life. 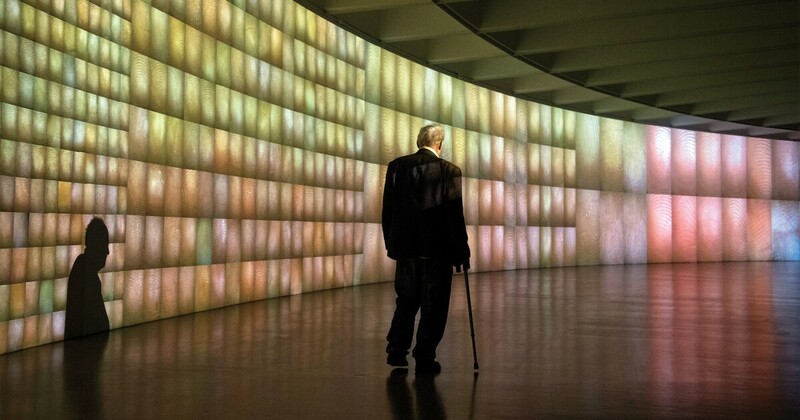 The exhibition is the Hirshhorn’s largest interactive technology display ever, and it wows its audience in three parts. In “Pulse Index,” participants put their fingers on a screen, which snaps a photo and projects the fingerprint onto the wall. Each panel has more fingerprints than the last, and 10,000 of them stretch before you. A father puts his finger in the slot while his young son holds the rest of his hand, presumably imagining that his own finger is projected onto the screen. In “Pulse Tank,” your fingerprint causes a device to hit a small pool of water at your heart rate. As the waves reverberate throughout the pool, a spotlight reflects the patterns on the ceiling. As more viewers participate, more of their heartbeats intersect. In “Pulse Room,” more than 200 light bulbs flicker on the ceiling. You enter to the sound of a low boom. Hundreds of heartbeats are resonating together. A crowd forms, and at the end of a long line a girl holds a pair of metal rods, waiting for them to pick up her heartbeat. It’s been several seconds, and she seems ready to leave. But the woman behind her, perhaps her mother, encourages her to stay on. “She’s human, I promise,” she quips to the people waiting in line. Moments later, hundreds of light bulbs flicker with the girl’s pulse. On Lozano-Hemmer’s description at the face of the exhibit, he says the poetry of the heartbeat begins in the womb. Lozano-Hemmer may have had another intention for the exhibit, and he may not even be pro-life. But art speaks for itself. As hundreds of fingerprints flash on a wall behind you, and hundreds of heartbeats rumble in the room before you, it’s hard not to remember that we’re all connected by a beating heart, and in the same moment, to remember when that heartbeat begins.